I have a confession to make. Your good friend, Blake, is thrifty and proud. It’s not my fault. It was the way I was raised. Since I was a baby I would hear my Dad addressing my Mom with his favorite saying, “It doesn’t take a genius to spend it”. Constantly. Now, it wasn’t said in a mean way, I don’t think, but it was consistent. With his mantra, I was thoroughly indoctrinated into his cheapskate ways. Now, I hear his voice in my head before making any purchase, big or small. One of the main reasons I share my story here is because I think a lot of people spend money without thinking. I suspect my father’s “life view on money” can help others. While I fervently believe dividend investing is the most viable strategy for long-term success in the stock market, I realize you have to have money saved before you can put that money to work via investing. So, in an effort to save that money – here are 9 things I don’t spend money on that allows me to save and invest more in the stock market. I have never purchased a car with anything but cash. I won’t deny, I come from a privileged home and my parents helped me with my first car purchase to the tune of $3,500. I put down the rest – $5000. But, stay with me here. I have been driving for over 20 years, purchased three cars and have never had a car payment. According to Cars.com, the average monthly car payment for a new vehicle is $509 a month. That’s over $6,100 a year! If this is your situation, I strongly recommend you do some math and see if getting rid of the car payment makes cents for you. Buying a less expensive car that’s safe, reliable and that you can afford with cash, might just save your over 6,000 bucks a year. So, this one is kind of a stretch, as I obviously have a mobile phone and plan. But, I don’t have the plan that the majority of my friends have. And I definitely don’t have the same expensive phone. According to an unscientific poll I took of my friends and colleagues, their average mobile phone bill is $68.32 (8 people polled) a month. Now, that’s not a huge amount of money, but it’s double what I spend for my cell phone plan. I only spend $20 a month with a discount carrier. As far as the phone, I purchased an older model smart phone for $200. That’s nowhere close to the $500+ latest and greatest phones my friends have (or the $20 monthly lease they pay the carrier for a fancy phone). Through my discount carrier service I save $48.32 a month or $579.84 a year. You might want pull out the calculator do some math and consider this too. I pack a lunch, everyday. Sometimes, it’s leftovers from the night before. Other times, it’s a sandwich, raw vegetables and hummus. Either way, it comes with me to work and consumed without me having to spend a single buck at a restaurant for food. For example, if you’re spending $6 bucks a day or $30 a week eating your lunch at McDonalds (MCD) – those hamburgers and fries are costing you a ton. Like $1,500 a year ton. Bring your food from home, save that lunch money and put it to work. Since you are reading this, I bet you probably don’t have cable. But if you do, get rid of it. Three years ago, I cut my cable and stopped renting my cable modem. I ended up saving myself a little over $900 a year. That’s a lot of money I freed up to invest. Alternative forms of entertainment are significantly less expensive and more enjoyable. I don’t buy drinks at coffee houses. Here’s why. According to this Forbes article, the average spend at Starbucks (SBUX) is $6 per visit!!! Now, if you’re doing that 5 times a week, you’re spending $1,500 a year on coffee. Save a boatload and make your own at home. It tastes just as good and you get to feel that sense of accomplishment of being your own barista and saving yourself some serious coin. This is where it might sound a little strange to you. I don’t pay for haircuts… and neither does my wife. We have both become DIY stylists and cut each others hair. Here’s the secret, we both watched some videos and became YouTube certified hair stylists. Granted, it was a little scary at first, but my hair looks great and my wife, well, she can still go outside with a hat on 😉 Not really, her hair looks perfect – I do good work! The average haircut cost for men is $28 and $43 for women. I used to get my haircut roughly 7 times a year. That’s $196 for me and $301 for her. That’s $497 a year of found money and an excellent relationship building exercise. Give it a try, and cut out that extra $500 expense. I don’t spend money to workout. It’s not because I don’t workout, because I do… well, sometimes. My workouts consist of running and bodyweight exercises (push ups, sit ups, burpees…), which are all free. According to this article, the majority of people with gym memberships spend $20 – $50 a month for a gym membership. In my area, I see a lot of anytime gyms that advertise $25 a month. That’s $300 a year that could be used for savings or investing! That’s a lot of money to spend on a service that many people pay for and don’t even use. I live in a house that I purchased when I was financially stupid. It’s significantly larger than what my family needs, however, we do something our friends view as unthinkable in our large home… we clean the house ourselves. We spend 10 – 15 minutes every night picking up, cleaning and vacuuming our house. It’s hard to start, but it really is an easy routine to get into. The average cost of a cleaning service is $150 per visit. Say you have cleaners come to your house once a month, that’s $1,800 a year!!! My lawn is as big as my neighbors and quite a bit larger that many of my friends. Instead of spending $60 twice a month (10 months out of a year) on a lawn service like they do, I maintain and mow my lawn myself. That’s $1,200 a year extra I save that they spend (it’s also good exercise). It takes me 15 – 20 minutes every two weeks… its worth it. Think before you spend, buy only what you need, and put that money to work by investing. You can do it! This is a fine frugality listicle, and your point is well made. We forgo a lot of these luxuries ourselves for similar reasons. But I have to quibble with at least a couple of your categories, namely the car thing and bag lunches. Your lunch and car costs may be less than your peers’ but they are still non-zero numbers. If you pack leftovers the next day, that original meal you made is pulling double duty but that doesn’t mean your lunch is free. As someone who does compare the cost of making delicious, healthful meals at home to going out, I actually find it kind of tough (although certainly possible) to compete with fast food on pure dollar terms. $6/meal is more than you need to spend, but you are going to have to spend something. Similarly your cars over the years have cost some amount of money. Now by paying cash you haven’t paid any interest which is certainly a big component of a car payment, but it isn’t all of it. I’m sure there are a few different ways to calculate it into a monthly dollar amount which is almost certainly less than $500, but again, it’s not zero. Several of your other categories have some costs too (i.e. you still have to buy your coffee beans and housecleaning supplies) but a lot of those are nominal to the point of basically being nothing, so we’ll leave them. Cars and lunches though? My guess is you save more like half compared to your peers, which is still great! I enjoyed reading this post and your point that we should think about every purchase even the small ones is a great one. I see your point and certainly agree that my cars and lunches do have a cost. However, the per unit cost for my lunches and cars are significantly less than those who are buying them everyday, are paying retail and are spending way too much on them. For example, my cars were all purchased used – instead of new like my peers. My cars were not luxury vehicles like my peers either. I payed 12k for my last car, where the average new car loan is $30,534. But, you’re right, I did not get it for free. I paid cash for what I could afford and had no monthly payment or interest cost. I guess we could also talk about opportunity cost of the money I used to buy the cars. Perhaps I could have invested the cash and have gotten a loan instead. Maybe I could have covered the interest costs on the loan (or I could have lost it all). But that’s getting lost in the weeds. With regards to food… A couple of years ago I calculated that I was spending roughly $1.55 daily on lunches (not free). It consisted of a can of tuna, mixed with some things served over lettuce It was delicious, but it did get old after awhile (it tastes better than it sounds). Like I mentioned, it’s mostly leftovers now, and the ingredients do have a cost, but it’s a fraction of the cost and portion size of what my peers spend and eat… and frankly, my peers are spending a lot more than $6 a meal. Right on. All small, seemingly simple things, that really add up over time. Great insight! Thanks Bob, a few dollars here and there really do turn into big money! 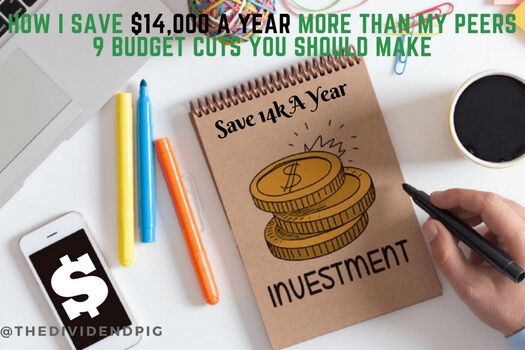 Skipping the daily coffee and making it at home for a fraction of the cost surprisingly makes a huge difference once you do the sums across the whole year. I also moved across to a different mobile plan late last year. Paying less money and getting double the download allowance. Hi MIM. I was really surprised at the average spend amount at Starbucks. I had no idea the hoards of people I see waiting in the drive through line every morning were spending that much! ha, we don’t pay for haircuts in our house either. mrs. smidlap is an artist by education and just figured it out. i’ve always found the gym membership thing a little silly. we did, however, invest in a stationary bike about 15 years ago because winter in upstate,ny can be brutal. it’s like driving to the park to walk the dog. just go outside and start walking instead. we own a lot of the same dividend payers. i just swapped out main for some more ohi. Well done! It’s not hard right? Just 2 or 3 youtube videos and your practically a haircut pro 😉 Glad to be in good company with the stocks. I own enough OHI now, but that 10% yield is certainly attractive at this point. I drink the free coffee at work. I jokingly refer to it as rot-gut, but it’s not bad stuff. Then again, I’m not really a coffee snob, so just about anything will work for me, so long as it has caffeine. I was drinking coffee everyday for a couple of years at home & work. I really took a liking to the Costco coffee. However, I’ve cut back on the coffee and substitute with tea as often as possible. You can find really good tea deals at Sprouts in their clearance section. I have another way that I save money on my daily coffee addiction that I just realized. I started drinking my coffee black. In the past, I had loaded cup after cup every day with Splenda and fancy flavored creamers. Not only is the sugar bad for your health but that stuff is expensive. With the amount of coffee that I drink, I probably save well over $100 each year by just drinking it black. Nice one! Yeah, creamer is crazy expensive, good thinking! Lol I just signed up from a yearlong gym membership yesterday and started my classes today. I’ve worked out at home in the past and did well with it at that time, but right now I need the atmosphere of group classes and away from home so this $450 CAD is worth it (of course only if I use it). On the other hand, I agree with every single one of what you wrote including the gym of course. First time visitor here, lots of great advice, will continue poking around your blog. Thanks! Hi Kay! There is nothing more valuable than health… so if you need the encouragement to get/stay healthy then it’s clearly worth it. Just don’t forget to go!